Understand that what you create will be an extension of yourself and as such make it as safe as possible, ultimately you are going to be on this. It will take a working knowledge or willingness to gather a combination of metal craft measuring, cutting, grinding and welding, also to include motorcycle and automotive principles. 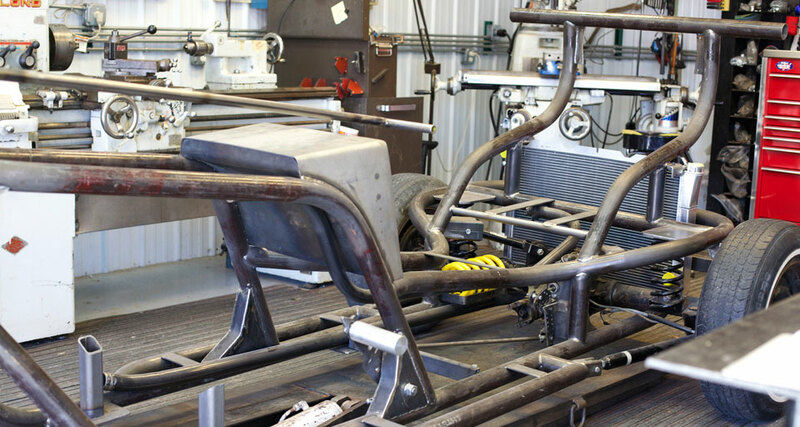 If you are looking for an unwelded bent only V8 Trike frame. Frame Jig is also available it is 40" x 40" made of 3" x 3" x 3/16" with 17" leveling legs and rear end cradle. The frame jig is Required if you are doing the machine work yourself. "Note these pieces take a great deal of time to attach"
Set up for large bearings with adjustable triangled 4 link suspension with shock mounts top and bottom. Stage 4 Kit Only - Does not include previous Stages. 2 one inch cores with right side inlet high left side low. Universal transmission cross member and universal engine pads and stands. Stage 5 Kit Only - Does not include previous Stages. Dash- Steel tacked in place inner dash, outer dash and blank gage insert. Upper and lower cooling lines right side low left side high run 12" short of radiator outlet and stubbed into engine compartment. Stage 6 Kit Only - Does not include previous Stages. Stage 7 Kit Only - Does not include previous Stages. Bulider front spring installed- when full weight is on trike supplied spring will have to cut down. Stage 8 Kit Only - Does not include previous Stages. Set Engine and Transmission in frame. will include 1 1/4" custom neck bolt and bearings. With a completed stage 10 Rolling Trike you bring a new (no dirty or oily pieces) engine, transmission and header. I will install springs and spring height in rolling trike. Including the front end and secure headers supplied by you to the frame. If you need a drive shaft I can have one fabricated. At this point you have a complete Rolling Trike with engine and transmission.